The beauty and culture and the freshness of Samoa is one of a kind and it’s something you can’t find in any other place. Commenting on Samoa’s beauty to the Dear Tourist team was Lawsen Harte, a young well-travelled boy from Hamilton, New Zealand. 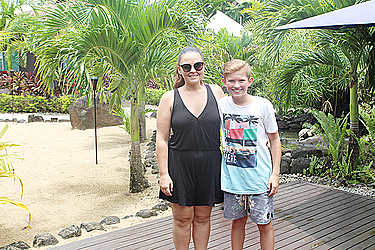 We met Lawsen with his aunt, Taryn Anderson, at the Saletoga Sands Resort waiting to visit the temple. “This is my first time here and I love it, it’s the best island I’ve been to, it’s the freshest and the cleanest,” Lawsen said. “I’ve been here six days. I went to the To Sua Ocean Trench and the waterfall and they’re both amazing, I’ve never seen anything like it, and I’ve just been relaxing, opening coconuts, swimming, finding turtles. We learned that it’s Taryn’s third time to Samoa, so we asked her of her experience and what keeps her coming back. “I’ve been here since Wednesday,” Taryn said. “The first time I was here, I didn’t actually leave the resort; I didn’t even go outside the gate, like everything you need is sort of like here. Speaking on the local delicacies, Lawsen said, it’s something that has made his stay a more enjoyable one. “The food is the freshest out of all the islands, it is top notch, the fish here is caught the day you eat it, in Fiji they might keep it there for a couple of days before you eat it and I feel the island is more commercialized now, but Samoa gives you the feeling like back in New Zealand, really nice, the fales are really nice,” he said. Lawsen also gave his opinion on local Samoans. “The Samoans, the local people can be very beautiful people, but they can be harsh people too, not all of them though, but most of them are really beautiful people,” he said. “I think it’s probably like Samoans in New Zealand are more westernized, like they are slowly adapting to the New Zealand culture, but I think there’s not much difference in terms of happy personality,” Taryn added when asked on the difference between Samoans here and New Zealand. They also spoke on marketing Samoa as a tourist destination and the importance of maintaining its natural scenery. “I would market Samoa’s beaches, scenery, like the nature, the people; I think Samoa is an amazing place really,” Taryn said. “It’s a great all-rounder really,” Lawsen added. “The beaches, the ocean, even going to the waterfall, it’s very scenic and lush and green, whereas a lot of the islands don’t have that,” Taryn said. “Developing some more could be an idea,” Lawsen added. “Maybe Apia needs a little bit of work, and little things like going to the waterfall, the road wasn’t really good and it needs a little bit of work, and you know if tourism is to grow, then there needs to be things that can bring in tourism, but I think if you change it more than it was, you’d take away the meaning, rawness and beauty of it, like the authenticity of Samoa itself should be the way it is,” Taryn said. “This is probably the most relaxing island,” Lawsen said. Samoa will no doubt see them again. “We’re just here to relax and have a holiday,” Taryn said. 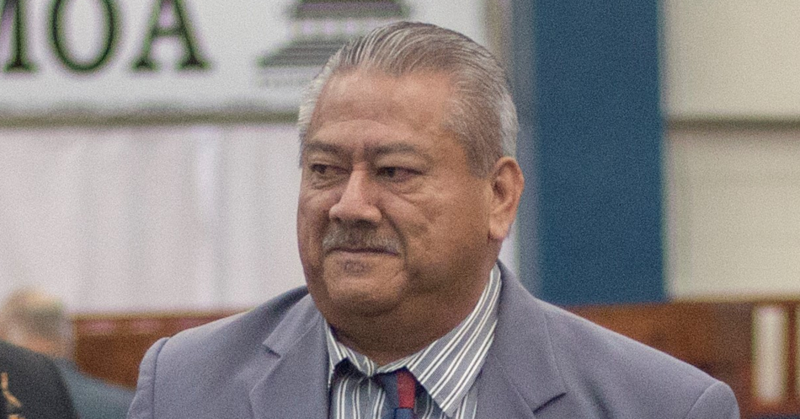 “Hopefully we go to Savai’i; I’ve heard a lot of beautiful things about Savai’i. “Lawsen loves it, he’s like actually planning his next trip already,” Taryn laughed. To them, second to New Zealand’s beauty is Samoa. “It’s the most beautiful place on earth, apart from New Zealand and we will see you again,” Taryn said.